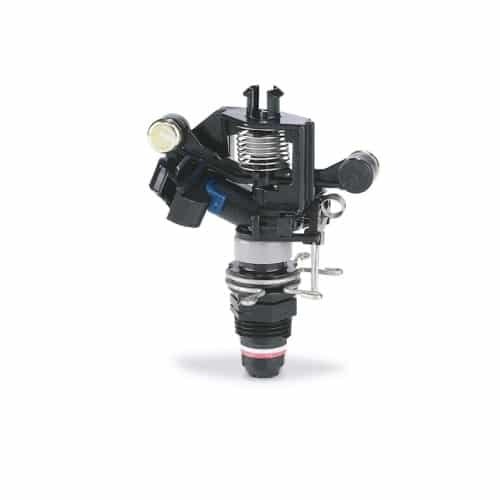 From the company that invented the first impact sprinkler, the 2045PJ Maxi-Bird is a rugged, high performance 1/2 inch riser mounted impact head that is ideal for watering slopes and large areas. Offering both full and part-circle operation and Rain Bird’s unique Precision Jet tube design, the Maxi-Bird helps you save water and keep landscapes lush and green. Double-weighted arm for slower rotation and increased distance of throw. Powerful reverse action. Includes blue #08 standard angle nozzle preinstalled. 1.5 to 8.4 GPM (0,34 to 1,91 m3/h; 0,09 to 0,53 l/s) 1/2" (15/21) male threaded inlet nozzles.